Applications : In these litigious, health-and ­safety conscious times, I do not recommend any ad hoc rope slings and chairs for working aloft or over the side. There are tested and certificated ladders and stages and harnesses for the well prepared. But all sailors sooner or later are faced with some urgent improvisation. This is one such knot, which can be used for lowering an injured person and other emergencies. One leg is put through each loop and the patient (if conscious and capable) holds tight onto the rope at chest level, or is somehow secured to it. It reduces the strength of the line in which it is tied by up to 40%. 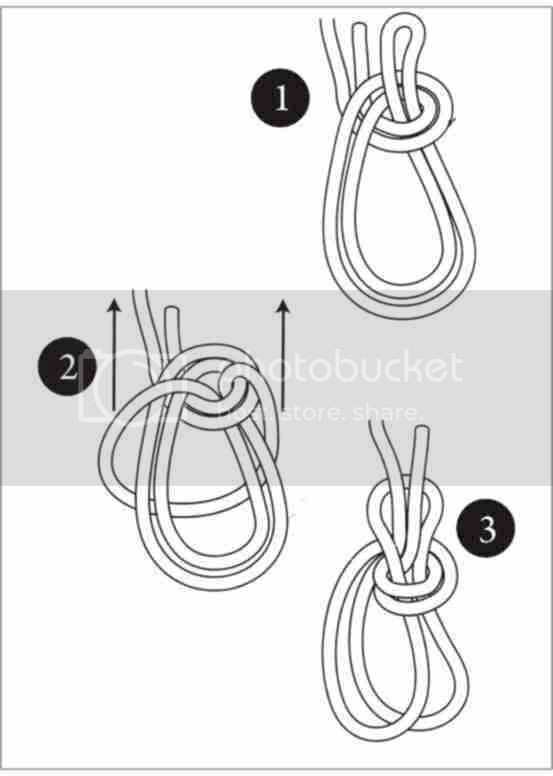 Method : As this knot is usually tied in the middle of a rope, it must be made without using either end. The early stages are done with a doubled end (1).The trick is then to pass the bight right over the pre­formed knot (2-3). History : This knot was illustrated in 1795 by Johann R. in his Allgemeines Worterbuch der Marine. In 1808 it was mentioned as the 'bowline upon the bight' by Darcy Lever, Author of Sheet Anchor.